Humanity is a cancer, and we are the cure. I’ve thought for a long time how I can write this review without spoilers, and I’m sorry, I don’t think I can. So if you’re planning on reading this series, skip this review. It’ll be better if you do. I’ll do my best to keep spoilers to a minimum, but it’d be better if you skip altogether. I hardly know what to say about this book. Tally has been turned into a member of Special Circumstances, in an elite group started by Shay, the Cutters. They are wired to live outside the city, have been made practically inhuman in their bodies, and cut themselves to keep their minds clear. They are alternately filled with anger and euphoria, and they think they’re superior to everyone. They have obviously had their brains screwed with as well as their bodies, the same way pretties do when they get their operation. Tally loves being a Special and a Cutter (of course – she’s been wired to!). She loves the connection of their skintenna, which allows the Cutters to communicate with each other through their skin, so that a whisper will carry miles outwards to every member of the clique. She loves being unique, special, and connected to this group (funny – she makes fun of a pretty clique in Pretties that does the same thing). But there’s one thing that upsets her – her boyfriend from Pretties, Zane, has not been made into a Cutter like her. It’s unexpected, and when she finds out he’s returned to New Pretty Town, she goes to visit him. Even more unexpected is how she now sees Zane. Her re-mutilated brain makes her see him as average and pathetic, and with Zane, it’s worse than with other non-cutters. His brain damage from Pretties made him mildly crippled, with shaky movements and lapses in cognition. He’s trying to get better, but all Tally can see is his shakiness and damage. He nauseates her. She wants more than anything to help him escape the city – if he escapes, he’ll prove he’s tricky enough to become part of Special Circumstances, and once he’s made cruel and wolf-eyed and “perfect” like her, she’ll be able to look at him again. A trek across North America follows, with an eventual lead to a new city free of pretty-brains, a bunch of new information, a cure for the specials that Tally rejects, and all out war between cities. I hardly know what to make of these books. With most books, I read, absorb, and compartmentalize. With these, I know immediately that I love them, but can’t seem to organize my thoughts. There’s so much in them! 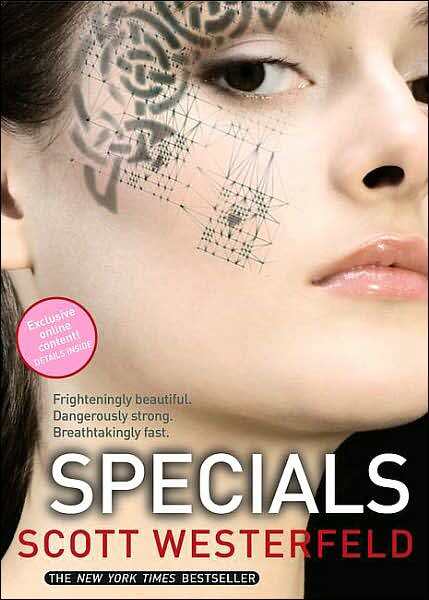 In Specials, Westerfeld addresses the issues of self-mutilation, the need to fit in, environmentalism, war, violence, revenge, death, brain damage, etc. I could go on and on. There’s so much, it makes me dizzy. That’s not a bad thing – it actually feels quite amazing to have something I can’t fully tackle. Something that I’ll have to read multiple times to absorb fully. Something that broke through my recent numbness and made me feel something very strongly. See, this book broke me apart – I hadn’t felt so strongly about a character in a long time. I loved Zane, and he didn’t make it. I didn’t expect him to die. I very rarely cry at books, but cried when he died. I not only cried, but when I finished the book, I went and reread both Pretties and Specials in order to spend more time with him, then cried the second time he died, too. Maybe that makes me pathetic, but I think the books have to be so well done in order to affect me like that. I will definitely own this series one day, and I will probably read it to pieces the same way I did Harry Potter. Specials isn’t as good as the other two books, in my opinion, but it’s not far behind them. The biggest flaws in the book (I’ll get to them in a moment) are countered by the fact that the book affected me so strongly. I think eventually I will come to love it as much as the others. Flaws. First and foremost, there is too much action in this book. There’s too much plot, and not enough characterization. There aren’t enough quiet moments. There’s a good balance in the first two books between action and quiet moments, and I appreciated that. The quiet moments weren’t slow, just quiet. I needed more of them here. I was relieved when Tally began to follow Zane and the other pretties across the continent – it provided a much needed break from constant stimulation. On the other hand, the book seemed to be written to match Tally’s state of being – as a Special, as a Cutter. Her world is a constant stream of stimulation, so it makes sense for the book to be. It’s not in first person, but the POV is limited and sticks solely with her. Second, I can’t yet reconcile the ending. Not after two readings. I can’t make sense of Tally’s decision, or perhaps I can make too much sense of it. In the end, despite everything she’s done, and despite everything they’ve done to her, she rejects the cure. She decides she can and has rewired her own brain, and is no longer a special-head. She thinks she’s freed herself from all her anger, euphoria, and feelings of superiority. She believes she’s learned to control herself. And in some ways, I agree, she does seem to control herself better, she no longer cuts herself, and she’s not quite as angry. On the other hand, the feelings of superiority haven’t gone away. She thinks they have, because now she can look at other people without mocking them, but at the same time, the only reason she doesn’t want the cure is because she wants to be unique, special, above-average. Her worst fear is to be ground back into averageness. In the end, people win. They escape from the “cure” that has been placed on them to stop the spread of a cancerous humanity. But at the same time, Tally loses. She’s still being manipulated, controlled, and pushed around by the things people have done to her. She won’t change, despite her vigilante decision to “protect the wild” at the end of the book. She’s not human anymore. I wanted so badly for someone to take her and force her eyes open! I wanted her to recover, to be free from this inhuman condition Shay and Special Circumstances forced her into in the first place. I wanted her to take responsibility for the fact that it was her Special condition that caused Zane to die and then to do something about it! I wanted her to reject being Special!! But, I suppose this is a dystopia, and the ending is mixed good and bad. There is no clear hope – humanity may be free, but it’s already starting to destroy the earth again – and there is no clear despair – Tally is partially human again. Such a confusing message. To me. Probably to others, the messages in these books are perfectly clear, but my brain can’t fully wrap around them yet. All I can say is, if anyone is reading this who hasn’t read this series (and you shouldn’t be!! Spoilers!! ), this trilogy is extremely worth reading. These have been my favorite books in awhile. It’s rare that I actually buy books instead of getting them from the library, but these will definitely join me soon, and have a spot on my special shelf, too. This entry was posted in 2009, Prose, Young Adult and tagged body image, multi-read, shredded me, speculative. Bookmark the permalink.